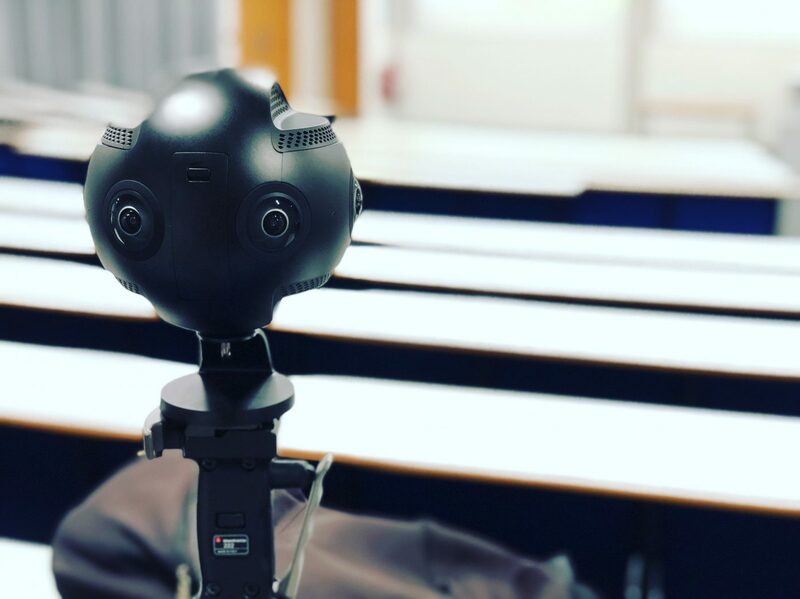 We were approached by the University of Southampton to produce an ambitious series of 360° videos to use at UCAS fairs around the country, and at similar events globally, that would give prospective students a taste of what life would be like after enrolling. The University’s plan was to create a number of Google Cardboard style headsets that students would be able to take home with them to view the videos in an immersive VR-style environment. There would also be several VR headsets on the University’s exhibition stands which students could pick up and use on the day. Our task was to help the University create the content that the students would watch within them. The concept of the video, which was co-developed by both Southpoint Films and the University’s marketing department, was to film a day in the life of a typical University of Southampton student. However, we soon realised that there is no such thing as a typical student at the University of Southampton, which has a wide and diverse syllabus across many faculties. The original plan for one video turned into nine videos featuring different courses, facilities and activities. When prospective students would come to watch the video at a UCAS fair or on the university’s website they would be able to choose which version of the video to watch based on their interests. As the video had a narrative, this cross-usage of footage required a tremendous amount of planning to execute a consistent story without continuity errors, especially as all nine videos couldn’t be filmed on the same day or with the same student actors in some cases. As for telling the story, we identified with the University very early on that the video had to make sense to a variety of audiences. As the videos were intended to be used at overseas events to attract international students to study at Southampton, we agreed that incorporating spoken word narration could be off-putting for prospective students for whom English may not be their primary language. Additionally, the videos were going to be watched at UCAS fairs where the sound wouldn’t be audible over the bustle of an exhibition style event. Because the videos were effectively silent, with a music track later added to avoid confusion for viewers watching online, we had to make sure that the story was told entirely on-screen. 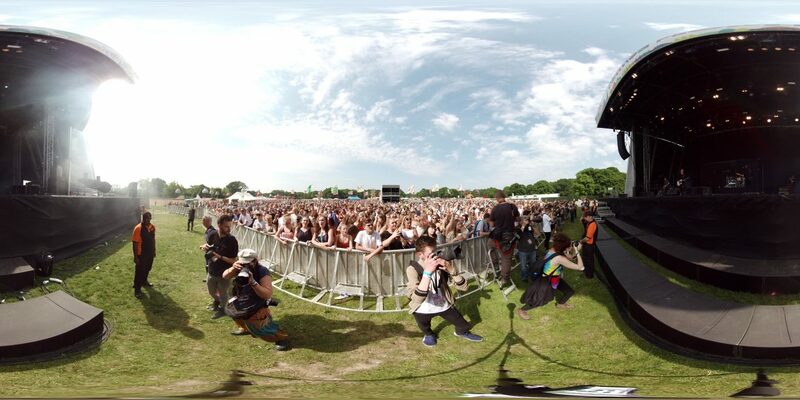 A screenshot from a 360° video clip filmed at Common People festival for the University of Southampton. This is how 360° video appears before it’s put into a virtual reality 360° environment. 360° video and VR (Virtual Reality) are new types of video and media technology that have started to gain traction in the past few years. The 360° video format gives viewers the ability to look anywhere in the video, which is a 360° spherical view of what was happening around the camera when the video was recorded. Viewers can look up, down, left, right and will keep seeing content at any viewpoint, even if they loop back around on themselves. When viewed with a VR headset this creates a highly immersive virtual experience, although 360° video can be viewed on desktops and smartphones too. The 360° video format poses a number of challenges when compared to “normal” filming. When producing a standard video, the Director makes a choice about what viewers will see and how they’ll see it. The Director can be selective about what’s shown on screen and this allows for flexibility with framing unwanted items out of shot, choosing to show close ups of certain points of interest, or simply hiding the production crew. This isn’t the case with 360° video. Everything in proximity of the camera can be seen by a viewer, and the viewer chooses what to look at. This aspect of 360° video can effect a video project in many little ways. For example, with this project, instead of wearing our typical Southpoint Films crew shirts, our crew wore “civilian” clothes so that they could blend into the background if they couldn’t avoid being in the shot. To a degree, we even had to cast our crew to make it look realistic that they would be in lectures or in the students’ union bar to avoid any obvious “crew in shot” gaffs. Some of our older staff would have looked out of place in some scenes, which would have ruined the immersion of the video for the viewer. 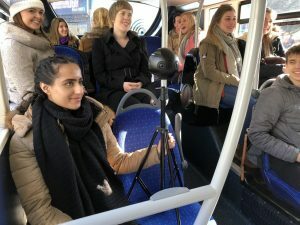 The wide field of view that comes with 360° video also poses bigger challenges, particularly when it came to filming in public spaces like West Quay shopping centre that weren’t fully under control of the production team. A person doing something unusual in the background, such as picking their nose or perhaps heckling with rude gestures, would be visible in the final video and could distract or offend the viewer. If issues like these aren’t spotted on the day it may result in reshoots, or the footage might not be usable at all, which is catastrophic for a narrative project like this one where each shot moves the story forward. Our solution was to film shots multiple times to ensure we had a variety of options in the edit, even if this did slow the production process down a bit. The final challenge with 360° video is hiding the equipment that’s supporting the camera – because, where the camera records a complete 360° image around itself, it picks up anything that’s underneath it too. In many cases, 360° video is typically filmed with static tripods so that they can be photoshopped out later. We knew at the outset of this project that we didn’t want to film the entire project this way as, having seen other 360° videos, we found the static approach quite dull. We were also keen to take our viewers on a journey around the city and it’s hard to do that without movement. Because the University of Southampton has a fairly large campus with many interesting buildings and beautiful green spaces which we want to show on camera, we decided that we would have an operator walk between locations with the camera. The difficulty was hiding our operator without obstructing too much of the field of view. To solve this, our operator would carry the camera on an extended tripod or monopod and walk while crouched down to minimise the size of their footprint. During the editing process we covered the operator with a digital “sticker” so that they weren’t visible in the video. While the 360° format takes a huge amount of control out of the hands of the Director in terms of deciding what viewers will be shown, we were still keen to direct the audience’s attention where we wanted it. This was partly to make sure that viewers could follow the story, but also to make sure that attention was guided to avoid the viewer becoming “lost” in 360 space. We didn’t want viewers to become disorientated because the action kept moving around their head, for example. The concept of the video was to give students a taste of what it was like to be a University of Southampton student for the day, and we wanted the viewer to feel like they were the student on a journey. 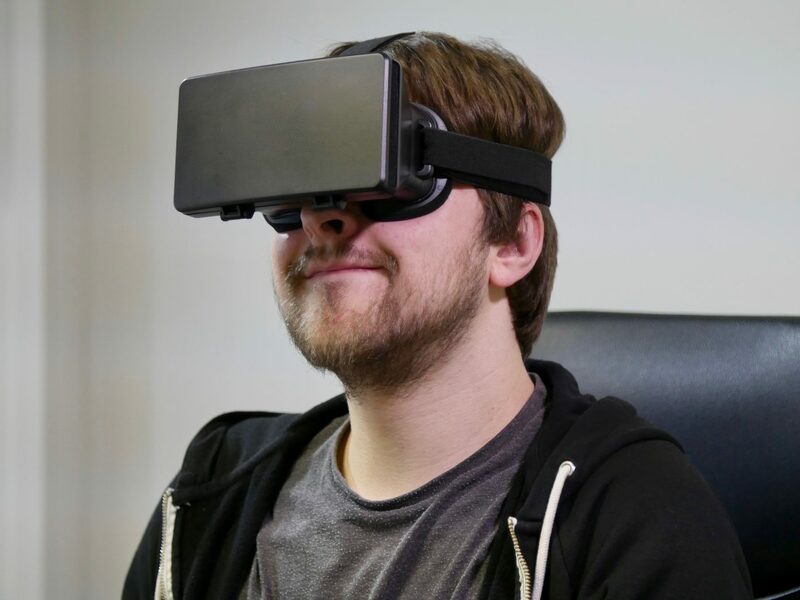 To make sure that the videos were working as intended, we would regularly review cuts on phone-based VR headsets that were similar in function to those being distributed by the University. We would then make changes and tweaks to ensure that the action was happening in a clear and easy to follow way without risking viewers falling out of their chairs to keep up. Overall, we’re really happy with how these videos came out and we understand that they’ve been received well by those who’ve seen them. While there were some technical learnings throughout this project, and some creative ones too, we look forward to taking on more 360° projects and bringing this expertise to more businesses and organisations who would benefit from it.